By using a photo eye to optically actuate the 1983 Series Opto-Cam Rotating Limit Switch is ideal for applications requiring high speed positioning, up to 3600 RPM, where a mechanical switch would not be able to function. 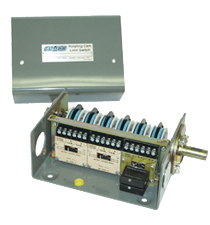 The 1983 Series Opto-Cam has 2-40 circuit rotating cam limit switch assemblies with NEMA 1, 4, 7, and 12 enclosures. It has AC and DC outputs with 3-amp plug-in opto 22 outputs. Also, a 3" micro-adjust cam for precision settings from 1° to 359°.